Women can find fulfilling jobs in the cycling industry and Laura Wilson, Business Development Manager with US bike company Specialized is proof of that. I’ve been lucky enough to know and work with Laura in her various roles at Specialized in Australia, over a number of years. She’s always impressed me with her professionalism, her warmth, and her willingness to help. I caught up with her via email recently. Q: How do you come to be working in such a male dominated industry like cycling? What industries did you previously work in? My career path has followed quite an interesting one. As a qualified Food Scientist I started my working career as a Quality Assurance Manager at a chocolate factory. Don’t ask me about the amount of chocolate I used to eat…it was purely for quality purposes! After a couple of years in the food industry, I packed up my bags and moved to London for four years, where I found myself working in advertising. When I returned home to Melbourne I remained in the industry and during this time Specialized was a client of mine. It was the first time that I worked on a brand that I quickly became very passionate about and was eager to be a part of. A position in the marketing team became available and I was the lucky candidate! At the time, Specialized was in its first year as a subsidiary in Australia and the team was being built from the ground up with what seemed a very even mix of both women and men. It was a very exciting time as cycling was booming and Specialized was at the forefront of bringing more women into the sport of cycling and into the cycling industry workforce. It has been 6 years at Specialized and I still love getting up every day and going into the office to work with such an amazing bunch of people. If you were to look at the Australian business you wouldn’t think it is a male-dominated industry, as we currently have around 13 women to 15 males. These 13 women are passionate, strong, career-minded, supportive and all play a big part in changing the perception of the sport/lifestyle of riding – as do the males in the business! And I would say this is quite consistent in all Specialized offices around the globe. Q: Do you face challenges as a woman? No, I don’t believe I do, especially within the walls of Specialized and out amongst our retailer network. 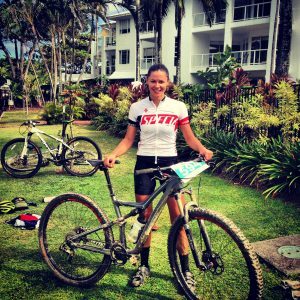 I think a few years back you could say it was quite a male-dominated sport out on the road and trails, but that is starting to change too. I remember when I first started riding, I came up behind a group of riders on Beach road and a guy on the back of the bunch said to his mates ahead of him, ‘ride faster we have a girl sitting on our wheel, let’s drop her!’ (?!??) Guess what…they couldn’t drop me after that! But things are a little different nowadays, we are seeing more women out riding and working in the industry. Brands are focused on inspiring and providing more opportunities for women to get involved whether it be through product, information or events specific-to, or just more encompassing of women. Retailers (I could name so many right here), cycling clubs (such as St Kilda and Hawthorn Cycling Clubs) and passionate individuals (such as Tina from Wheel Women), cycling media/bloggers (Ella CyclingTips, Kath Bicknell, Nicola from Women who Cycle) are writing about women and the sport, holding skills sessions, female-specific races and events to inspire and encourage participation no matter the level of skill or riding style/fitness. Q: What’s a typical working week look like for you? Do you get much free time to ride your bike? A typical working week is a busy one, but we always make time for riding, whether it is commuting to-and-from work, early morning training rides or our much-loved lunch rides. We also attend events on weekends, so we get to fit in rides with the local riding communities where the events are held. I have had the opportunity to work in different roles within the business – marketing, women’s business development and now a general business development role that is looking at ways to ensure we stay competitive in the digital era. Working in the cycling industry quickly becomes a passion and a lifestyle – and what an awesome, healthy and fun industry to be part of! Q: How can the cycling industry attract more women? Do more of this and show what it is really like behind the scenes within cycling brands, as well as retail. I think the biggest gap for representation of women in the industry, is at retail. I would say there is a perception that you can’t build much of a career within retail and there is also a habit of retailers posting jobs only within cycling networks and not outside of that, so opportunities are often missed by those that may be interested. Within retail, there are great opportunities to focus on marketing, events, business, community building, finance, retail merchandising, mechanical services and of course sales. The more women working in retail, could also help to bring more women into the store to ask about bikes and riding. Q: What’s your favourite type of riding – road, mountain or something else? Tough question – I love both road and mountain almost just as equally, but for different reasons. Both are just as sociable and fun, but road satisfies the inner speed-demon in me and mountain provides the challenge and adrenalin rush, especially on one of my favourite tracks – Cressy’s Descent (track 13) out at the YouYangs! And of course a lazy Sunday ride around town is always fun, especially when you slow down and take everything in. Q: How do you think we can all work to get more women riding bikes? Oh the golden question, one that I have mulled over so much, especially as part of one of my roles as Women’s Business Development Manager at Specialized. Bit by bit, the puzzle is starting to piece itself together and all the key players who can influence this are making some ground. The cycling brands (Liv, Trek, Juliana, Specialized) and so many more brands who have dedicated their time and resources to encourage more women into the sport and lifestyle need to keep doing what they are doing. The retailers and clubs who are making an absolute effort to provide a supportive environment to talk bikes, ride bikes, meet people and take part in group rides, events and races. Getting more women working in retail will also help, not only will the passion spread, but the store will be that little more easier to walk into as a female and talk about. The number one thing is to just get bums on saddles. Starting off riding in a safe, fun and encouraging environment and you’re bound to be hooked! J It’s not until you actually try riding, do you realise how good it is for health, the soul and making friendships that will last a lifetime. Tell us about your experiences and share how women can find fulfilling jobs in the cycling industry.